Well I have been away longer than I had planned. One of the main reason is I am still processing my feelings/thought that surround my fathers death. A small part was the My wife and I skipped away for a long relaxing weekend at a cabin just off lake Michigan, as a 1st anniversary trip/ late honeymoon. Though the weather was not what we would have liked, and MJ sadly was fighting a cold it was a very good weekend away, though I am kind of disillusioned with “cabins”, they just seem way more money for not much more than you get with a hotel room. The last reason would be the following article http://www.anamcaraservices.com/articles/2012/9/24/do-you-know-what-happiness-looks-like.html I recommend everyone read it. 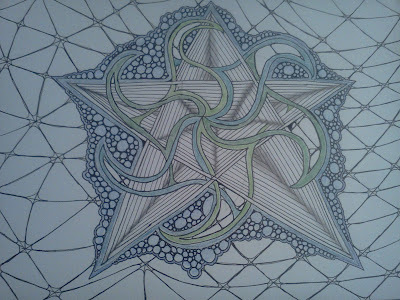 This article made me stop and think about what truly makes me happy, and Zentangle® is high up on the list. Attached are a couple of my recent ZIA’s, I am on a quest to do a tangle merging Aura-knot and Fengle, this is close to what I want, but I would like more interweaving. 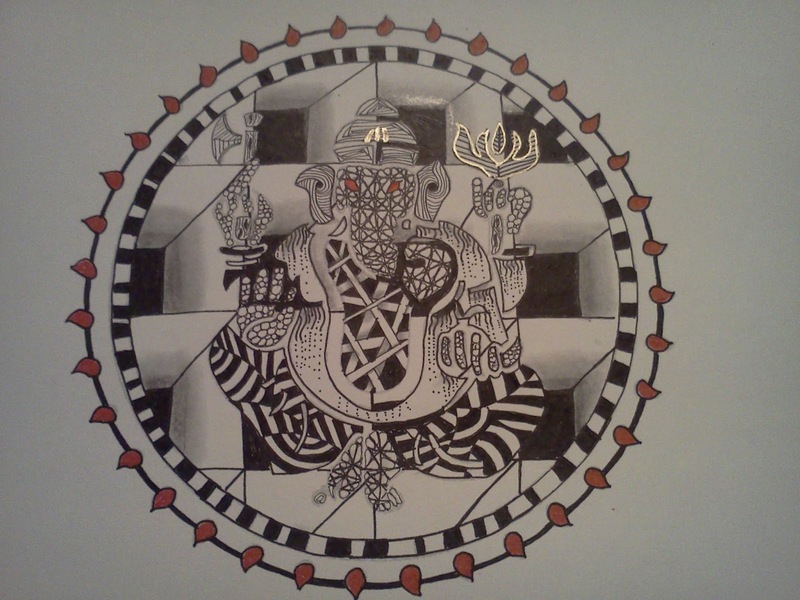 The second is a new Ganesh I did on vacation for Dilip Patel. What a gorgeous Ganesha Roy! We must go on helping Dilip to gain the 100 before the end of teh year. I already made two and hope to make one more this week. Thank you for the link to the article about happiness, I think it's a great reminder of what we already know. Thanks very much, Roy. Lovely Ganesha. Shall publish it on my blog in a couple of days.